Whether you need a building demoed, or need to move out large amounts of concrete or asphalt you will be covered by our years of experience. We sort debris extremely efficiently with grapplers for our excavators. 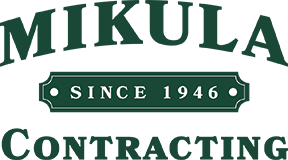 water, stormwater damage, or trench drainage systems when you work with Mikula Contracting. We will handle the complete drainage design so you can focus on what’s most important, your own business. Seepage Pit Installation, and Standing Water Drainage. Big or small, we are here to help educate you through the entire drainage solution process. Are you in need of a commercial Excavator? We can help you with excavation construction, foundation excavation, rock removal, and trench excavation. We can handle all your land clearing contractor needs. We work with with the area’s top builders and developers; whether it’s a new home development or addition to an existing structure. following trench shoring excavation services. Installation underground utilities and sewer excavations. the equipment and experience for any sized job. Drainage is a job that brings along many complex issues for property owners and developers. We provide drainage solutions that include the installation of seepage pits. Seepage pit installation is performed on the property and provides a drainage field underground for any excess water. Let us make sure that the ground is ready to be developed to the engineer’s satisfaction. Our commercial material removal services include both demolition debris and common fill removal. When working on excavation jobs we sometimes come across boulders that might require removal from the property. Our equipment is large enough to handle most boulders. Have a larger installation that needs a rock wall? We can install it. If you are in the hotel, apartment, or senior-living community business and need to fill a pool we will we take care of all of your town’s permits and inspections. As well as give you a free estimate and step by step timeline of your swimming pool demolition. We are a NJ licensed company and also OSHA compliant. We will take care of your landscape to ensure not only your property but the surrounding area, as well. You need emergency snow removal or a consistent snow removal contractor, we have you covered. Our state-of-the-art commercial snow removal equipment will keep your businesses up and running smoothly during the snowy winter months. We work alongside top environmental firms for all NJ Oil Tank Remediation jobs. We will take care of all the required permits and walk you through each step of the process. Large or small load of stone, fill, or sand that you need delivered to a construction site; we will take care of all of your logistical needs when transporting your valuable materials. Home Improvement Contractors License 13VH00769700, Underground Storage Tank Certified Closure Contractor and OSHA Certified.